but UPS did come late last night and I received some new goodies. Studying for CPR can wait right? I decided to give sketch challenge SC159 at SCS a try this morning, and will study for the rest of the day (ummm, until some other sketch ideas come into my head…lol). The card base is Close to Cocoa CS 4-1/2″ x 10″ folded in half. Sponged edges with Chocolate Chip ink and stamped flowers with Close to Cocoa ink. Next is the bottom of card layers of CS — Purely Pomegranate CS 3″ x 4-1/4″ and Berry Bliss DSP 2-7/8″ x 4″. Used Ticket Corner Punch to bottom corners and sponged all edges with Chocolate Chip ink. Added Fire Circles Rhinestone Brads to these bottom corners. Finished off base of card with a strip of Chocolate Chip Satin Ribbon tied in a knot. For the main image — I stamped the large flower on Purely Pomegranate CS 2-1/4″ x 2-1/2″. Next layer is Pretty in Pink CS 2-3/8″ x 2-3/4″. Last is Chocolate Chip CS 2-3/4″ x 3″. Used Ticket Corner Punch to all corners. Sponged all edges with Chocolate Chip ink. Used Crafters’ Tool Kit (Paper-Piercing tool and template) to create piercing to edges. For large main flower: First, stamped flower in Purely Pomegranate ink on Pretty in Pink CS, cut out and adhere to base Purely Pomegranate CS piece. Second, stamped flower again in Purely Pomegranate ink on Close to Cocoa CS, cut out and adhere. 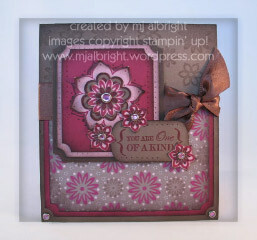 Third, next flower layer is Purely Pomegranate ink on Pretty in Pink CS; Boho Blossoms Punch to the flower and adhere. Forth, final flower layer is a small petal flower and used Boho Blossoms Punch to the flower and adhere. Finish the main large flower with a pink Fire Circles Rhinestone Brad. All edges of the flower layers were sponged with Chocolate Chip ink. Still with me??? There are three smaller flowers that are Purely Pomegranate ink on Pretty in Pink CS. Used Boho Blossoms Punch. The next layer to these are Purely Pomegranate ink on Close to Cocoa CS and cut out by hand. Finished these three with pink Fire Circles Rhinestone Brads as well. Stamped sentiment in Purely Pomegranate ink on Close to Cocoa ink. Used Key Tag Punch. Paper-piercing added. Added a flower to the bottom right of the sentiment. What a GORGEOUS card!! I love the layering and depth on your center image. Definitely a technique I want to try out!! Gorgeous! Wow! Don’t ya just LOVE new stuff? 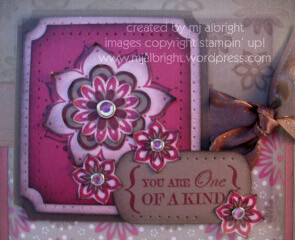 This card is amazing, I love how you cut out the center and did the flower, just beautiful!